Every few weeks, my Facebook newsfeed throws me an article like “Most Livable Cities” or “Best Cities for Quality of Life”or “Happiest and Unhappiest U.S. Cities” or somesuch. These rankings are generally quite different (though with a few common themes), and often include — in the top ten or so — the home city of whoever shared the link with their fellow facefriends. The livability of a city isn’t related to the happiness of its people. Livability rankings comes in two types, which I call Chill Rankings and Jetsetter Rankings. The statistical models of livability that they produce are totally different, and there is no overlap in their top ten cities. A few cities crack the top 25 for both types, though, suggesting a more balanced lifestyle: Washington DC, Boston, San Francisco, Pittsburgh, Minneapolis, Seattle, Buffalo, Honolulu, Portland, and Houston. Surprisingly, cost of living and pollution have little relationship with livability in either type of ranking. In full disclosure, this was originally just an excuse to play around with structural equation modeling (more below). But I also wanted to take an inductive approach to livability — to blenderize all these contradictory lists and try to learn something from them. The typical approach seems wantonly deductive to me — e.g., rank cities by average rent, household income, commute time, and violent crimes per capita using census data, and then sum those rankings into an overall score. Nevermind that rent and income are strongly correlated (and effectively double-counted), or that crime should maybe count for more than commute time. Some of these rankings come from studies by scientists who know how to deal with these complexities, but many are compiled by journalists (or their interns) based on intuition alone. I wanted to design the meta-analysis around SEMs, which I discovered from papers on social influence in online communities. SEMs were first articulated by Sewall Wright, a geneticist at my alma mater UW-Madison… and apparently a frequent dinner guest at my band‘s singer’s mother’s childhood home. (Small world!) But my training as a computer scientist did not include SEMs in school or any formal setting. I’ve been eager to learn more and find an interesting application. SEMs are graphical models with the sweet ability to create hypothetical latent variables and uncover statistical relationships between them. 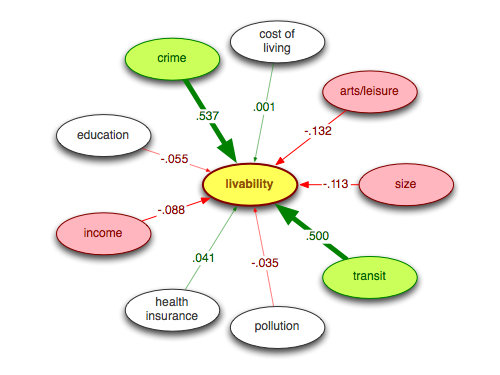 For example, there isn’t really a way to measure livability, precisely, but we can tap into so-called “manifest variables” — like these Facebook-flung livability lists — to create a “latent construct” that summarizes them all. The idea is that this construct represents the “true but hidden” livability measure, and all these rankings are “symptomatic” manifestations of the underlying scale. The same can be done for for cost of living (a construct of the average rent, price of gas, cost of a slice of pizza, etc.) or education (a construct of the percentage of residents with various degrees). 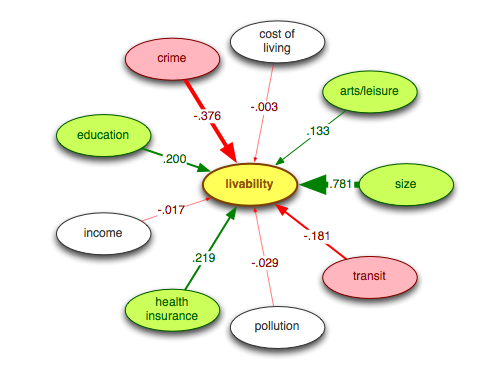 We can also essentially perform a regression analysis to see how constructs like cost of living and education might influence livability. All these variables are latent constructs. To create them, I first needed manifest variables, so I wrote some scripts to download and munge a buttload of social and demographic data about the 292 largest cities in America with populations over 100,000. Sources included the Census, FBI Uniform Crime Reports, Consumer Price Index, EPA, and Google Places API. I won’t explain here exactly how I used these sources to make the constructs above (from manifest variables like number of art galleries per capita, median home value, per capita murders, percent population below poverty level, etc.). But I’ll put the data and gory details on Github. I used the PLS Path Modeling package in R for the analyses. 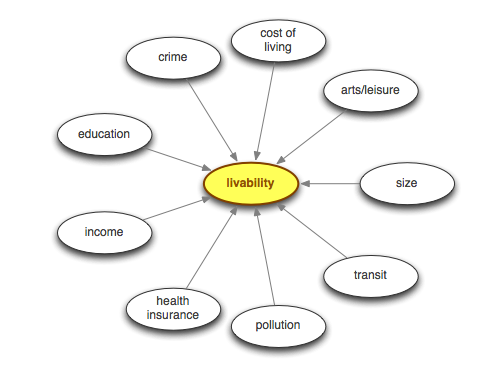 The livability construct is the most crucial. For this, I gathered 18 different livability rankings: mostly aforementioned articles from my Facebook feed, plus rankings from websites dedicated to the subject (AreaVibes and Livability.com), along with U.S. cities ranking in the well-established EIU and Mercer global quality of life rankings. I also included ratings from the 2013 Gallup-Healthways State of American Well-Being Report. Our research indicates that people care about more than happiness alone, so other factors may encourage them to stay in a city despite their unhappiness. This means that researchers and policy-makers should not consider an increase in reported happiness as an overriding objective. The second interesting thing is that the remaining rankings all point to the right (the first principal component dimension), but some point up while others point down (the second dimension). So the rankings form two “clusters” which are pretty much independent of each other. Most rankings above the fold come from American websites, reports, and consumer advocacy groups. Rankings below the fold come from international outfits or arts and business oriented groups. Let’s call the first cluster Chill Rankings (i.e., all-American, domestic, down-home), and call the second cluster Jetsetter Rankings (i.e., metro, international, cosmopolitan). Now let’s see what the SEM model looks like when we fit it to rankings in the Chill cluster. In truth, I didn’t use all the Chill rankings as manifest variables… I removed one at a time with the lowest factor loading until the livability construct became sufficiently “internally consistent.” More specifically, I ended up using six rankings that achieved Cronbach’s alpha of 0.74, Dillon-Goldstein’s rho of 0.82, and first and second eigenvalues of 2.6 and 0.95, respectively. According to Sanchez (2013), these are acceptable values for construct reliability. 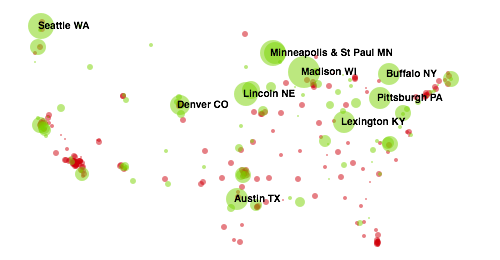 The color and thickness of each arrow indicates the direction and magnitude of influence (green is positive, red is negative). Constructs with significant effects on livability (p < 0.05) have their nodes filled in with color. We can see from this is that the most livable Chill cities are larger but with low per capita crime, have high education levels, good access to health care, and more per capita amenities for arts & leisure (things like art museums, movie theaters, public parks, etc.). However, they have limited public transit options. OK, what happens if we just throw all 18 rankings together into a big hot mess? For starters, the livability construct isn’t as internally consistent as the other two (alpha 0.67, rho 0.75, and eigenvalues 3.4 and 2.4, which are all a little suspect). However, an interesting mix of cities emerges. The table below shows the top 25 cities for this hodgepodge ranking, alongside their ranks in the Chill and Jetsetter constructs for comparison. 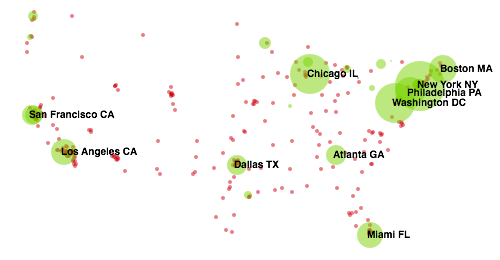 Cities in the top 25 for all three models are highlighted in green. Having spent some time in about half of these cities, I would say the highlighted ones seem to strike a better balance between down-home comfort, affordability, and culture with metropolitan vibes, history, and urban lifestyle. The Chill and Jetsetter rankings are basically unrelated. In the principal component plot up top, the vectors for the two big clusters are pretty much orthogonal. 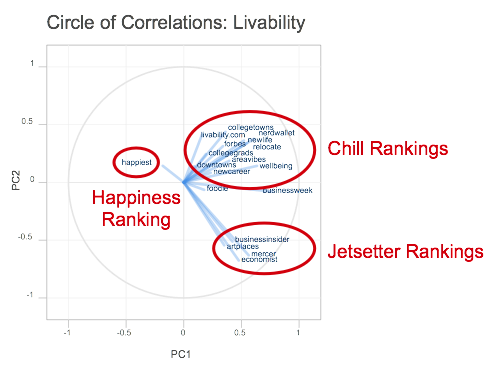 And while the Chill and Jetsetter livability constructs seem weakly correlated at first glance (Pearson’s r = 0.28, p < 0.001), it turns out that this is because Davenport, Oxnard, West Jordan, and a hundred or so other places are at the bottom of both lists (in part due to a missing data problem discussed below). When you filter out the cities that simply bottom-out in both rankings, the correlation goes away (r = -0.01, p = 0.91). Sample bias. While I did not hand-pick the rankings used for the Chill Model, it is a little suspicious that three of its top ten cities are places I’ve lived (Lexington, where I grew up; Madison, where I spent 9 years in and out of grad school; and Pittsburgh, where I live now). I consider all these places to be quite livable, and even remember them being named “most livable” by some measure or another while I lived in them. But it’s also possible that the set of rankings I started out with was biased: they mostly came from my Facebook feed, and most of my friends live in these places! Missing data. Confession: the majority of these livability rankings simply list the “top ten” (or 50, or 100) places. So most of the manifest variables I could use for the livability construct had missing values for some of the 292 cities. My way of dealing with this was to invert the ranks (i.e., the city ranked #1 in a top ten list had value 10 since it is “more” livable; rank #10 had value 1, which is “less” livable, etc. ), and any cities missing from a particular list had value zero. This approach was probably unfair to places like Boulder, which seems quite livable but just didn’t crack any top ten lists. The puzzling influence of size. One of the most surprising results is the weight of the size construct in both models (created from three manifest variables: 2010 and 2013 populations as well as land area in square km). It’s odd that size has a positive weight in the Chill model and a negative weight in the Jetsetter model, when the latter cities are in fact much larger. The top 25 Chill cities have population 601,900 on average, compared to 1,163,000 in Jetsetter cities. My guess is that size interacts weirdly with crime (which is a superlinear function of size) and with arts/leisure (which is negatively correlated with size: r = -0.43, p < 0.001). The crime and arts/leisure constructs are normalized per capita, so the true effects of size might be masked by some sort of “tie-breaking.” For example, Madison and Chandler are similarly large, but Madison is more Chill, with less crime and more arts/leisure to offer. Likewise, Indianapolis and Washington DC have similar crime rates, but Washington is more Jetsetter even though it is smaller. I tried adding more links to the SEM graph to start modeling some of these interactions, but the weights didn’t change much and the overall goodness-of-fit actually degraded. Since I’m an SEM newbie, I gave up for now but there is probably more to explore here. Cost of living and pollution. It is also interesting that these two constructs, which seem like reasonable influences on livability, have essentially no effect according to either the Chill or Jetsetter model. Perhaps, like “happiness,” they ultimately aren’t major considerations when weighed alongside everything else that can impact quality of life in America. Hi there, Burr! Just ran across your site (I’m an aspiring data scientist, so read about active learning a bit) and accidentally saw this post. What a coincidence – just recently I’ve finished working on my Ph.D. dissertation (to be defended soon), which uses SEM as main method and ‘plspm’ R package for PLS-SEM – it’s a small world, isn’t it? In my study I also use open data, but of different nature (open source repositories; also have tried startup ecosystem open data). Unfortunately, I don’t see any promised information on this project of yours on GitHub – have you deleted it or haven’t had a chance to publish? My dissertation research software project is there, in case you’re curious (it’s not documented perfectly at the moment, though). Feel free to connect with me online. Best wishes, Aleksandr (Alex). Forgot to mention that I liked this post very much – nice analysis and reporting! Thanks for the post: you did an amazing job! – I am working to take over as Data Analyst, having a background in social sciences with some data analysis working experiences (now attending online DA courses). – I moved to Vancouver, BC, (1 of the most liveable cities in the world !?) from Italy 3 years ago. Well, I had the intention to start digging the web to find any source of data for these well-known liveability researches, which I highly doubt; and your post is just enlightening.